crafts, games, pocket chart ideas, fun with poems, and more! Printable craft ideas, games, mini book, play-doh mats, games, and more to go with your cat and dog themed lessons in preschool or kindergarten. Page 4, 5 and 6—2 Printable worksheets. Color, trace, cut, daub. Page 7 and 8—Dog’s Dots Mini Book—Color dots, trace words, count dots, and write number. Pages 9 to 13—Patterns to make a cat hat. Page 14—Patterns to make a cool cat necklace. Page 19 to 22—Roll a colorful cat dice games. 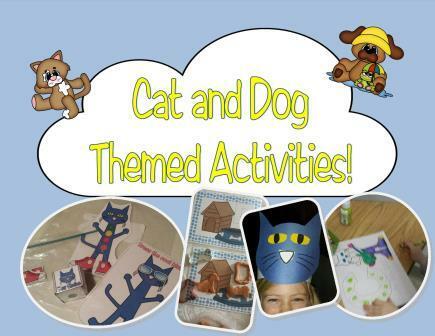 Page 23 to 25—Cat and Dog Play-dough Mats. Page 26 and 27—Two favorite cat poems. Page 28 to 30—Pocket chart beginning sound pieces for sounds C and D.
Page 31 and 32—Roll cats and dogs—tally and graphing. Page 32 to 32—Pocket chart pieces. Students count the bones 1-8 and match them to their number. Page 39 and 40—Picture vocabulary cards to go along with the book Clifford’s Good Deeds. Page 44—You choose your skill puzzle. Print, laminate, and program with numbers or letters. Then cut. Student puts the puzzle together by sequencing the number or letters. Page 46 to 51—Raining Cats and Dogs Counting Puzzle Game. Super easy set-up for this game. Just print and cut and you are ready to play. Directions included.